Be able to KNOW and CONTROL what’s happening – or about to happen – in your program anytime, anywhere. 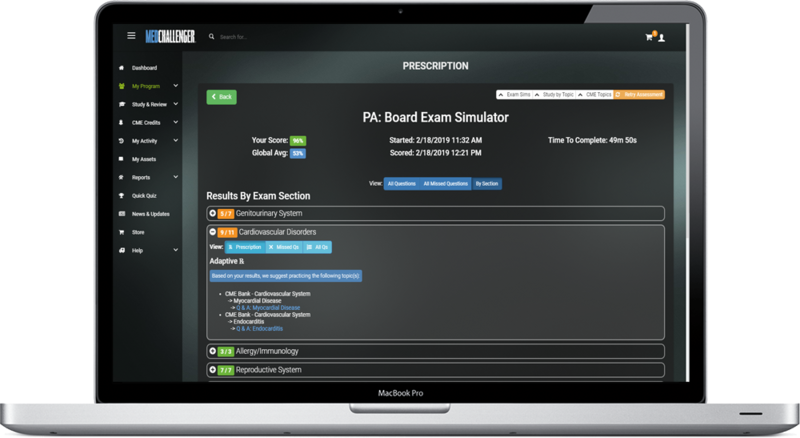 Med-Challenger’s online PA training education platform provides everything PA training programs need to quickly and easily evaluate, remediate, strengthen, and predict physician assistant education outcomes for outstanding results – and save valuable time and labor in the process. Call 1-800-676-0822 | email sales@chall.com. Physician assistant training, simplified – and supercharged. 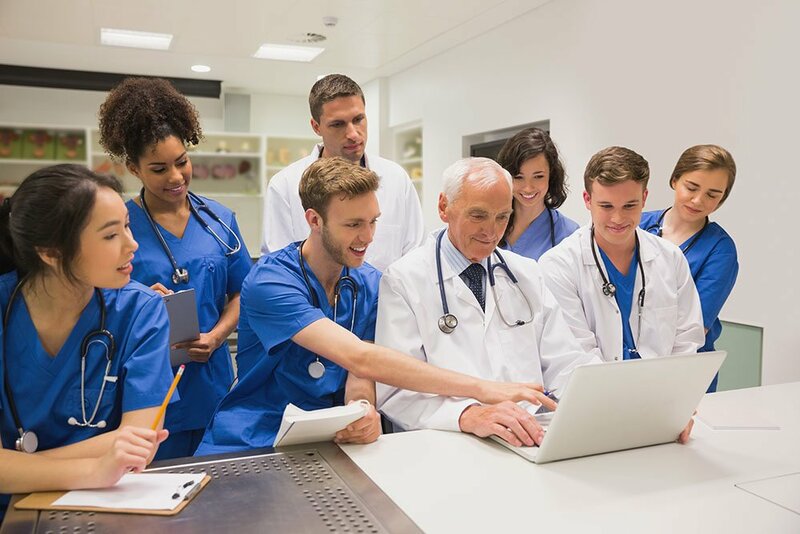 Our 24/7 online education platform gives physician assistant program faculty access to everything they need to assess, control, and improve training efficiency, activity compliance, and performance outcomes easily, online. 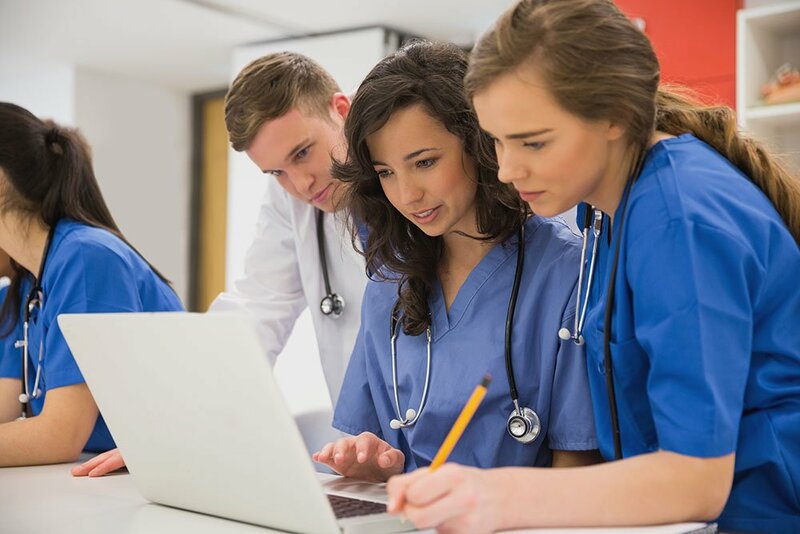 Program managers using Med-Challenger for adjunct training and assessment have reported improved scores, pass-rates, and learner compliance as well as reduced time requirements, labor, and surprises related to physician assistant training. With gold-standard question banks, assessments, and custom content tools built-in, Med-Challenger’s online physician assistant education platform allows PA program directors to easily create, assign, and track PA knowledge assessment activities. 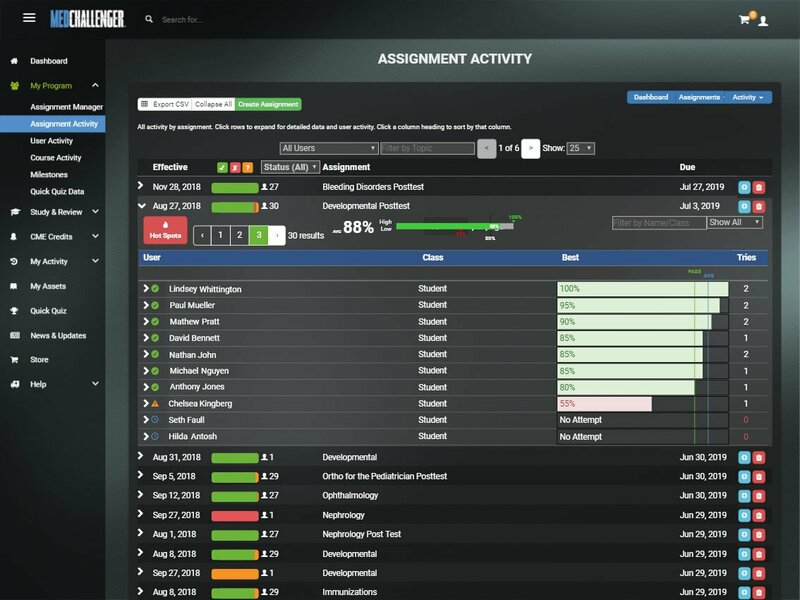 Program directors can quickly monitor activity compliance, knowledge proficiency, and exam performance predictors for all learners, groups, and locations – on one screen – from anywhere. Everything is incredibly easy to use, flexible, and powerful in producing higher exam scores, identifying and fixing outliers, and helping every physician assistant class matriculate on time. It’s perfect for both traditional campus-based programs and clinical distance learning programs – large or small, the entire platform can be enabled for your program immediately without complexity or delay. Everything works 24/7 via any Internet-enabled device. Big power. Because “self-study” alone falls short. More than just great content and testing, we give you total education control and performance analysis – and results. You can simply provide self-study – or you can drive results. Our group education product is a complete system, not a blind-eye “here ya go guys, good luck” box of online questions. We provide the education management tools today’s QBank-pushers simply don’t – or can’t. We’re specifically aimed at group education outcome control and performance improvement, where knowledge and training systems are lacking, labor-intensive, or non-existent – and solutions need to be instant, hassle-free, easy to use, and effective. Our physician assistant curriculum covers the PANCE Exam Blueprint, and Practice Requirements for PAs. Leverage up-to-date, ready-to-use, gold-standard PANCE exam prep curricula and PANCE blueprint-based question banks for fast and effective training and knowledge assessment adjunct to live instruction – your way – without any content & exam maintenance. Everything your physician assistants need to know – out of the box. 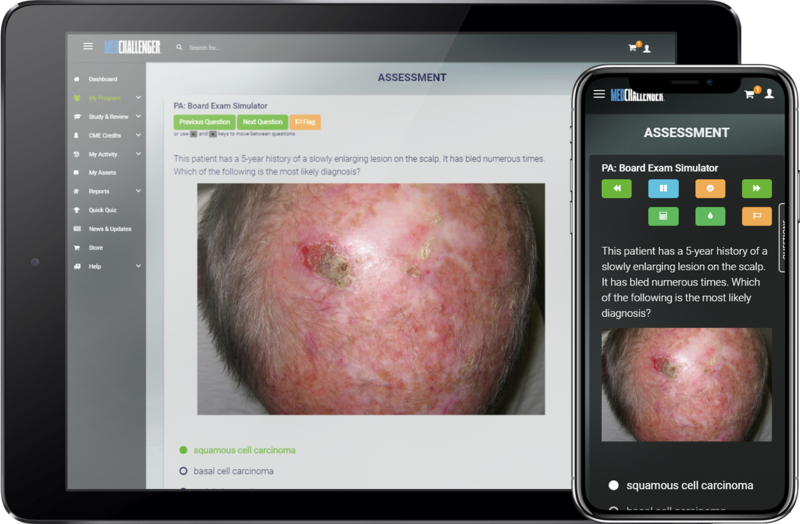 Med-Challenger’s online clinical education platform puts hassle-free content and knowledge assessment adjunct to live instruction in your hands for immediate use and impact. *We have a complete library of courses available. We has developed fifteen Clinical Post-Rotation exams which are reviewed and updated every year by NCCPA-certified educators so you don’t have to – and – to ensure the content is always of high quality so your results are high-yield. You can custom select any assortment to use or use them all. All Clinical Post-Rotation exams are peer-reviewed by practicing PA educators. NCCPA publishes a content blueprint of the material that will appear on the exam. This is how we determine which material appears in exam simulations. Intelligent testing detects knowledge deficiencies and issues corrective remediation automatically – without faculty labor. No longer do you have to create your own post-rotation exams, commonly refered to as “end of rotation exams (EOR)”. Our adaptive Smart Assessments learn and address each learners knowledge deficiencies. Assessment logs, charts, and graphs help you see all activities, outcomes, and trends. Post-assessment prescriptive summaries gives learners paths to self-study in “weak areas.” Learners self-correct knowledge gaps on their own! Create & Use Custom Content! 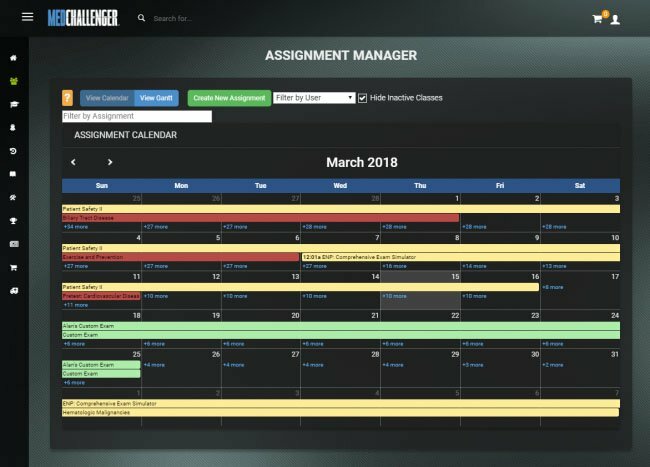 You can even blend content assets (ours & yours) to quickly create unique, re-usable, “gap-proof” custom curricula and assessments specific to your program. Create and organize your own Custom Questions and Question Library. Build your own questions and organize your question library with drag-and-drop ease. Build question stems, options sets, remediative answer explanations, and references. No HTML coding experience necessary. Use custom questions in custom exams. Share questions with other administrators. Custom questions can also be shared across program faculty for team-based education & assessment efficiency. 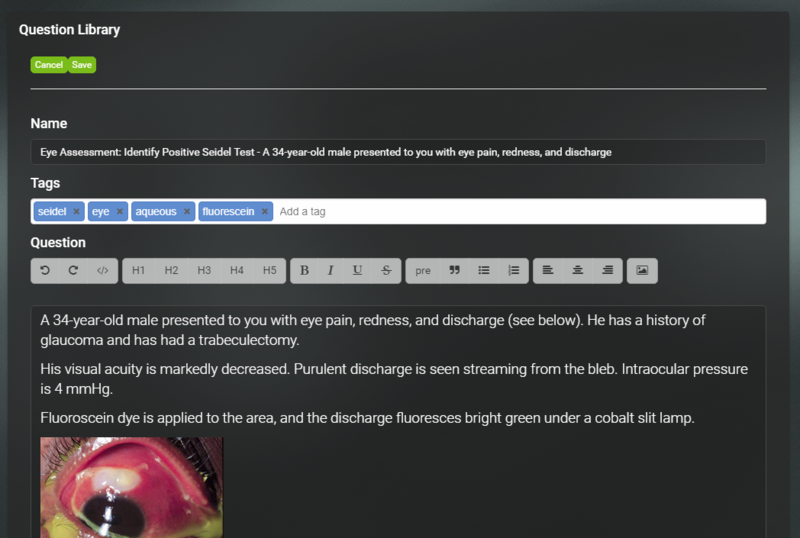 Build custom exams online using any of your content assets and assess physician assistants how you want, when you want – and monitor performance. Test knowledge exactly how you want. Saved custom exams are re-usable & intelligent adaptivity targets remaining deficiencies every time. Build exams quickly using pre-built content – use your own questions – or blend the two. In either case, you can easily create and deploy rotation-based assessment adjunct to live training objectives in a way that improves compliance, performance, and quality of life for all. See what’s happening – or what’s about to happen – and stop surprises. Track real-time assignment compliance, results, and predict performance. Want more control? Schedule, track, and monitor assigned activities, set special assignment rules, and track performance across your group – in a snap. Send assignees e-notifications of assignments. Schedule your assignments on shared Calendar or Gantt chart views. Make changes or see results on the spot. On-screen dashboards to PDF exports of data, Med-Challenger provides performance metrics, proficiency analysis, exam performance predictors, and outcome documentation ease. Monitor Progress. Track Activities & Predict Outcomes. Hot Spots output – see what questions were missed the most by assignees for “next-step” planning. Dashboards allow you to track performance across your group at a glance. Compare assignees to program peer & global averages. Quickly see what assignments are complete or not – and which assets have and have not been utilized. Output .CSV and print-friendly score report data by data range, learner classes and more. 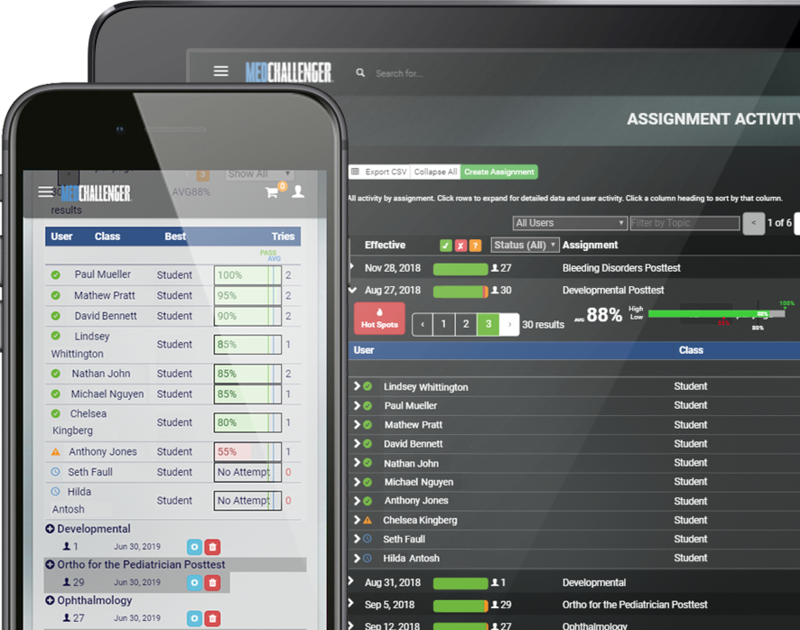 Watch real-time outcomes, compliance, and compare learner performance. 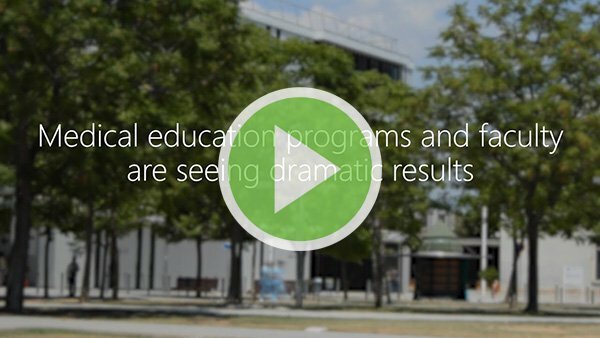 Get key insights into program cohort progress, outliers, areas of difficulty, and be able to detect, predict, and effectively react to problems before they impact outcomes. With everything you get – there’s a ton of extra benefits too. Faculty can use course assets for personal MOC needs, such as board exam review, fulfilling annual MOC requirements, and to earn specialized CME/CNE credits. Save yourself and your colleagues personal MOC time, labor, and money! Along with seamless core content updates, we issue free weekly knowledge quizzes and informative practice guideline blogs that help keep everyone current. Med-Challenger provides an easy way for program faculty to log and report on ACGME Milestones and Entrustable Professional Activities (EPAs) in various specialties. Keeping materials up-to-date and relevant is a full time job. Let us do it for you. Use our gold-standard content instantly, supplement with your own, or vise versa. Fact is, you can start deploying adjunct education immediately - and customize your assets as you go. On screen to rule them all. Stop chasing data - have it come to you. Our online system brings all data into one view. Perfect for remote or distance learning programs. Spice things up. Add a little game-style competition by displaying online assessment questions in a live group environment. Use live discussion to reinforce learning concepts. Easy on. Easy off. Since our platform is completely self-contained and built for ease-of-use, there are no IT hardware needs or application conflicts to worry about. We can have you up in a few minutes. Pricing is completely straightforward - pick your courses and the number of user accounts you need. No complex contracts - even use a credit card. What's even better - we have ways to onboard your learners through self-pay online enrollment. Our support team has worked with hundreds of institutions and their program faculty. We help everyone learn the platform and make quick use of all features for improved results. We also offer a 24/7 support site with helpful FAQs and tutorials. Here’s just some of the comments and reviews we’ve heard recently. Get a Free Program Trial Today! Everything you need for improved scores & pass-rates at your fingertips. No IT set up needs. No content maintenance. Instant start up. Easy to use. There’s no reason to delay improving your medical training program outcomes.